Hans Wilsdorf (March 22, 1881 – July 6, 1960) was a German-born British founder of noted watch brands Rolex and Tudor. 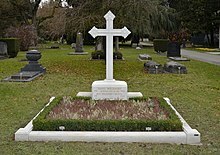 Hans Wilsdorf was born in Kulmbach, Germany, to Protestant parents, Anna and Johan Daniel Ferdinand Wilsdorf and was the second son of a family of three children. 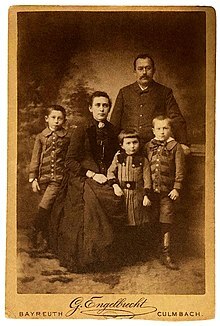 The photo above shows Hans Wilsdorf (front row right) standing in front of his father, with his mother sitting down between sister and brother. His mother died when he was a boy and he became an orphan when his father died soon-after when Hans was twelve years old. 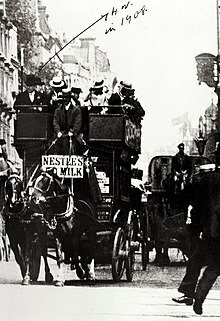 Hans' fate was placed in the hands of his uncles who sold the prosperous family business which had belonged to his grandfather, and later to his father. Hans and his brother and sister were sent to excellent boarding schools where they received superb educations. "Our uncles were not indifferent to our fate; nevertheless, the way in which they made me become self-reliant very early in life made me acquire the habit of looking after my possessions and, looking back, I believe that it is to this that much of my success is due." Hans Wilsdorf excelled in mathematics and languages, which inspired him to travel and work in foreign countries. Hans began his career as an apprentice with a highly influential international pearl exporting company. The valuable experience Hans gained played a crucial role in all of his future dealings. In 1900 Hans began his career in Swiss watchmaking when he moved to La Chaux-de-Fonds to work as an English correspondent and clerk with the influential watch firm of Messrs. Cuno Korten, ru Leoppold Robert, where he was paid a salary of 80 Swiss Francs. At the time, Cuno Korten exported around one million francs worth of pocket watches on an annual basis. Cuno Korten worked with all grades of watches, and manufactured a small number of watches from the ground up. Hans Wilsdorf was responsible for winding hundreds of pocket watches everyday in his role with Cuno Korten, as well as making certain all watches were keeping accurate time. Hans Wilsdorf gained tremendous insight into watchmaking during his time with Cuno Korten, where he gained valuable knowledge about how all types of watches were produced around the world. In 1903 Hans Wilsdorf moved to London, England where he went to work for another high-quality watchmaking company. In 1905—with a modest amount of money—Hans set up a business with Alfred Davis named Wilsdorf & Davis, located at 83 Hatton Gardens in London, England. Wilsdorf & Davis' goal was to provide high-quality timepieces at affordable prices. During the first decade of the 1900s pocket watches were ubiquitous, and wrist watches, referred to at the time as a "wristlet" were frowned upon. Hans Wilsdorf was an early believer in the potential of the wrist watch, and made it his mission in life to popularize them. Hans Wilsdorf had become aware in 1902, during his stay at La Chaux-de-Fonds of Hermann Aegler who was based in Bienne, Switzerland, who had begun producing 'ebauches', which are rough movements for high-quality, small lever escapement watch movements. In 1905, Hans traveled to Bienne, Switzerland and placed an order with Hermann Aegler, which resulted in the largest order ever made for wristlet watches. This began a long-standing partnership between Aegler and Rolex, until Rolex bought out Aegler a century later. In 1914, a decade after Wilsdorf moved to London, World War I broke out, at which time Wilsdorf changed the name of Wilsdorf & Davis to The Rolex Watch Company Ltd. Fourteen days before World War I began, On July 14, 1914, Rolex was the first wristwatch in history to be awarded a Class "A" certificate from the famous Kew Observatory. Rolex had grown so quickly, in 1914 they had more than 40 employees on their payroll. "My personal opinion...is that pocket watches will almost completely disappear and that wrist watches will replace them definitively! I am not mistaken in this opinion and you will see that I am right." In 1915 the British government implemented a 33% customs duty that prompted Rolex to move its international headquarters from London, England to Bienne, Switzerland. In 1919 Rolex moved its headquarters to Geneva, Switzerland where it remains to this day. In 1927 Rolex patented and launched the first commercially viable waterproof watch which was knows as "The Rolex Oyster". Rolex also selected watch dealers in each town to act as exclusive dealers, and provided each of them with special window displays that consisted of an aquarium with plants and goldfish, along with a Rolex 'Oyster' wristwatch. People passing by would be shocked to see a watch functioning properly while being submerged in water! Hans Wilsdorf realized the advent of the Rolex Oyster was a major innovation in the history of horology, and invested a great deal of resources in advertising. His first Rolex brand ambassador was a female swimmer named Mercedes Gleitze who swam the English channel while wearing a Rolex Oyster around her neck. After Mercedes Gleitze, Hans Wilsdorf turned to land speed king, Sir Malcolm Campbell to represent Rolex as a brand ambassador. Malcolm Campbell shattered land-speed records 9 times between 1924 and 1935. In 1931, four years after Rolex shocked the world with the Rolex Oyster which was the first waterproof watch, they launched the worlds first wristwatch with an automatic mechanical movement, which they dubbed "The Rolex Perpetual". The Rolex Perpetual would automatically wind its movement by harnessing energy captured from a bi-directional rotor that would pivot on a center axis inside the Rolex watch. Just like the Rolex Oyster, the Rolex Perpetual was another horological game-changer. By the start of World War II Royal Air Force pilots were buying Rolex watches to replace their inferior standard-issue watches. However, when captured and sent to POW camps, their watches were confiscated. When Wilsdorf heard of this, he offered to replace all watches that had been confiscated and not require payment until the end of the war, if the officers would write to Rolex and explain the circumstances of their loss and where they were being held. Wilsdorf personally oversaw this effort. Hans Wilsdorf and his first wife, Florence Frances May Wilsdorf—Crotty, never had any children, and she passed away from an illness during World War II in 1944. In 1945 Hans Wilsdorf setup the Hans Wilsdorf Foundation, to which he handed over his 100% ownership stake. The Hans Wilsdorf Foundation owns and controls Rolex to this day, and donates a great deal of its income to charity and social causes in Geneva, Switzerland. In 1945 Rolex set another horological precedent when they introduced the first wrist watch to feature an aperture window that automatically showed the date by using a date-wheel. The Rolex Datejust was another game-changing first in the world of horology, and ended up on the wrist of many famous world leaders including Sir Winston Churchill and U.S. President, Dwight D. Eisenhower. Wilsdorf also established the high quality, lower-priced watch brand Tudor, a subsidiary company of Rolex, in 1946. On March 6, 1946 Hans Wilsdorf made the following statement regarding the Tudor brand"
In 1954 Rolex launched their first specialized diving watch known as "The Rolex Submariner." Rolex worked with legendary French explorer and aquanaut, Jacques-Yves Cousteau to test early prototype Rolex Submariner watches. The Submariner became commercially available after it was introduced at the Basel Fair Show in 1954. In 1954 Rolex introduced another radical, avant-garde "tool watch" known as the GMT-Master. The GMT-Master had all the usual Rolex features including a watertight Oyster case, Perpetual movement, with luminous hands and markers, but added a 24 hour hand designed to keep time in a second timezone. Also, it features a rotatable 24 hour bezel which was luminous. The GMT-Master was originally designed for Pan American Airline Pilots and navigators as well as world travelers. Rolex introduced the Day-Date model in 1955, which was the first wrist watch to feature both a day-of-the-week aperture window, as well as a date aperture window. This made it easy for the wearer to know the exact day of the week as well as the date of the month at-a-glance. The Day-Date was somewhat similar to the Rolex Datejust at 36MM in diameter, but featured a slightly thicker case. The Rolex Milgauss was introduced in 1956 with a Reference Number of 6541. This watch was designed with special anti-magnetic features for scientists who worked in research labs like CERN in Geneva, as well as for people who worked in power plants or medical facilities what could be affected by magnetism. The original Rolex Milgauss featured a second hand that looked like a lightning bolt, and in many ways looked like the Rolex Submariner. Hans Wilsdorf died in Geneva, Switzerland on July 6, 1960. He was buried in Kings Cemetery in Geneva beside his first and second wife. Tomb of Hans Wilsdorf. Kings Cemetery, Geneva. This page was last edited on 7 April 2019, at 22:14 (UTC).